If the setting allows casual style, pair a white and red horizontal striped long sleeve t-shirt with a white skirt. If you feel like stepping it up a bit now, add a pair of red satin pumps to the equation. Show off your fashionable side by wearing a red sequin cropped top and a See by Chloe Cotton Blend Eyelet Skirt from LUISAVIAROMA. Rounding off with a pair of beige leather pumps is a guaranteed way to inject an extra touch of style into your ensemble. A grey star print crew-neck sweater and a See by Chloe white skirt are a good ensemble to keep in your sartorial arsenal. You can get a bit experimental with shoes and complement this look with a pair of tan leather pumps. 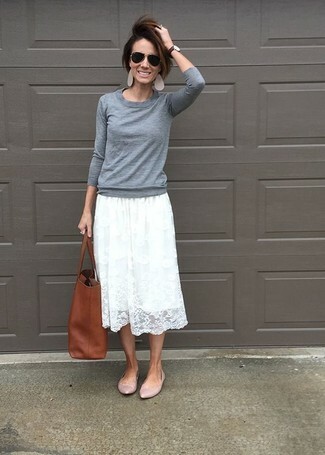 This is solid proof that a white oversized sweater and a See by Chloe Cotton Blend Eyelet Skirt from LUISAVIAROMA look amazing when you team them together in a relaxed ensemble. Let your styling credentials really shine by completing this look with beige leather pumps. When comfort is prized, this pairing of a grey crew-neck sweater and a See by Chloe Cotton Blend Eyelet Skirt from LUISAVIAROMA is a no-brainer. For something more on the classy end to finish off this outfit, complete this ensemble with a pair of pink leather ballerina shoes. For a cool and relaxed ensemble, make a blue denim shirt and a See by Chloe white skirt your outfit choice — these items play pretty good together. The whole look comes together when you complete your outfit with a pair of brown leather cowboy boots. This combo of a beige button down blouse and a white skirt is a safe bet when you need to look good but have zero time to spare. To add an extra dimension to this outfit, complement this ensemble with a pair of beige leather heeled sandals. 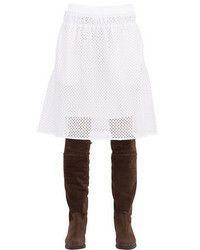 A white print sweatshirt and a See by Chloe Cotton Blend Eyelet Skirt are a savvy outfit to have in your current repertoire. Clueless about how to finish off? Complete this look with a pair of silver leather low top sneakers to dial up the chic factor. A beige oversized sweater and a See by Chloe Cotton Blend Eyelet Skirt from LUISAVIAROMA are essential in a great off-duty closet. Grey suede over the knee boots are a guaranteed way to inject an extra dose of elegance into this ensemble.